(780) 722-0086 Have a Question? Luxury Townhome Living at its absolute Finest! This stunning brownstone style 2 master bedroom, 4 bath home in Griesbach Woods has over 2400sqft of refined living space. The open concept main floor has maple hardwood throughout, stainless steel appliances, granite countertops and plenty of cabinets in the kitchen, as well as a gas fireplace in the living room which leads out to the beautifully landscaped private southwest-facing back yard and Double Garage. The basement is fully finished with an exercise room, 4pc bath, and sound insulated media room. The second floor is spacious with 2nd master bedroom with en-suite bath, a laundry room, as well as a bonus room that could easily be converted back to a 3rd bedroom. The 3rd floor loft is a true sanctuary with 14 foot vaulted ceilings, a Juliet balcony to watch sunsets, and a huge walk-in closet, and 6-pc en-suite bathroom with double sinks, soaker tub, and large shower. 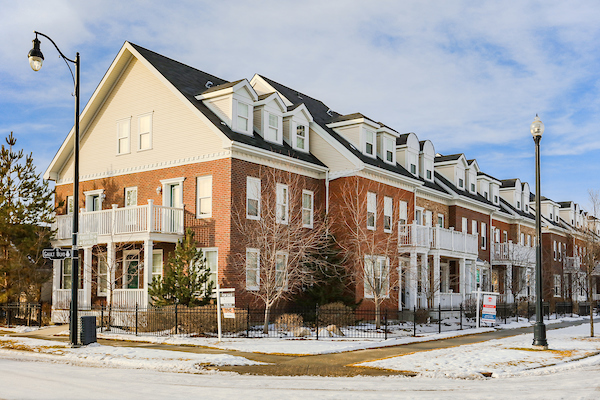 Just a quick 15-20 minute drive to downtown Edmonton, this exclusive property offers shopping and commuting convenience located in a beautifully designed and landscaped neighbourhood. PLEASE READ! Townhomeliving.Livrealestate.Ca REQUIRES CONSIDERATION FOR AND AS A CONDITION OF ALLOWING YOU ACCESS. ALL PERSONS UNDER THE AGE OF 18 ARE DENIED ACCESS TO Townhomeliving.Livrealestate.Ca. IF YOU ARE UNDER 18 YEARS OF AGE, IT IS UNLAWFUL FOR YOU TO VISIT, READ, OR INTERACT WITH Townhomeliving.Livrealestate.Ca OR ITS CONTENTS IN ANY MANNER. Townhomeliving.Livrealestate.Ca SPECIFICALLY DENIES ACCESS TO ANY INDIVIDUAL THAT IS COVERED BY THE CHILD ONLINE PRIVACY ACT (COPA) OF 1998. Townhomeliving.Livrealestate.Ca contains links to other web sites. Please note that when you click on one of these links, you are moving to another web site. We encourage you to read the privacy statements of these linked sites as their privacy policies may differ from ours. Do you have a good faith belief that your intellectual property rights have been violated by Liv Real Estate? Do you have a good faith belief that a third party may have uploaded content to Townhomeliving.Livrealestate.Ca? 1. Please describe the copyrighted material, work or other intellectual property (collectively "Material") which you believe is being infringed upon, and where on the Townhomeliving.Livrealestate.Ca website the Material is located.